Growing up in the late 60's early 70's I have many, many fond memories of Peanuts characters in my life. I was way too little to read or understand the comic strips, but I remember cherishing a number of these little square hardcover books when I was a very little kid. 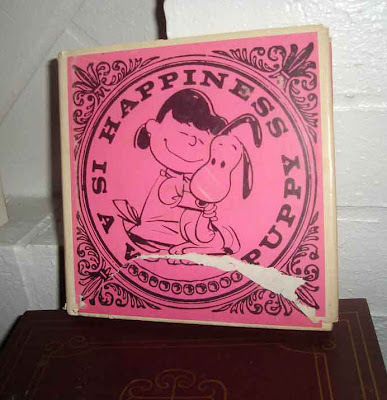 Happiness is a Warm Puppy (first published in 1962) was a huge hit in the decade of peace, love, and bomb-banning, and this was very much the look of Peanuts merchandise at the time: Strict black line art printed on very heavy - not always particularly pretty! - colors. 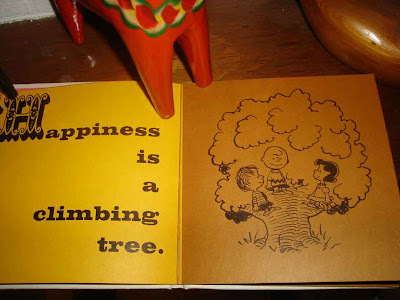 These may look odd compared to the mostly pastel stuff you see today from Peanuts, but back then shirts, banners, and sleeping bags with Peanuts characters and quotes are slogans were everywhere. (the torn dust-jacket here may throw you off - the title isn't carried through to the book below). 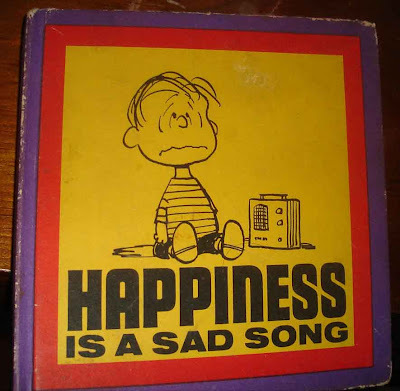 Happiness is a Warm Puppy inspired sequels, like Happiness is a Sad Song. It also inspired many parodies, some "ribald" as they would have been labelled back then, and some innocent. Probably the best known is "Happiness is a Warm Gun," a slogan seen in a gun magazine which inspired the Beatles song. Much less known these days, I think it's safe to say, is this example from Johnny Hart's line of B.C. comic strip paperbacks. 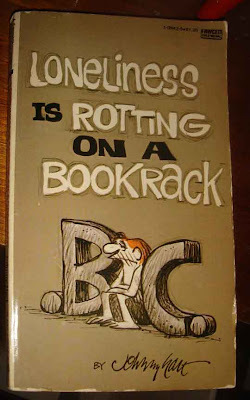 I didn't make the connection myself until I saw it on the shelf near the Peanuts books - but I'm sure it wasn't lost on the book-buying public back in 1972 when it was released. Hart preferred puns in his strips, and even book titles, but he probably just couldn't resist a little self-deprecating comparison to the number one selling Peanuts merchandising juggernaut he was "competing" with. Well, they're all good reads, and remind me of my childhood. anytime I come across a B.C. paperback I don't have for a quarter, or one of those funny little square solid-color books for a good price, I still like to pick them up today. I'm going to sprain a brain lobe trying to come up with a Big Bang Theory-esque title each time, but heck, it's fun. Here I am trying to post more than once a week, and about the whole range of my collecting and fandom, but I keep getting so much cool Big Bang theory stuff sent my way, that's all I'm getting on here. But I'm not complaining! What's your favorite thing about playing Sheldon? In a weird way, (it's) all the longer passages they give him to say-especially the ones laden with scientific terms. I mean, they are mind-numbing at times, trust me, but there is no satisfaction like the kind you get from not only memorizing these, but from making sense of them-both for yourself and the audience. 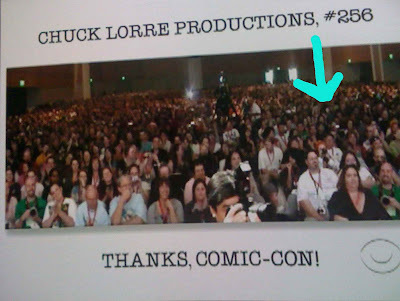 When you heard that "The Big Bang Theory" had been picked up for two seasons, how did you celebrate? I lead a very lame life in terms of celebrations. So, there was no champagne uncorked or anything like that. I remember thinking immediately of all the new scientific terms this would mean I would have to memorize (or, in reference to the above question, "GET to memorize!"). When you're not shooting your own TV show, are you a big TV watcher? What do you order from the Commissary on the Studio lot, and what's your favorite thing from craft services? The Commissary has the most wonderful peanut butter cookies I've ever eaten. As far as our own craft services is concerned, Jeannette is such a wonderful human being-she not only always has something delicious set out, but is constantly asking if she can make one of us something in particular. I love her. Who is the biggest celebrity you've seen on the Warner Bros. lot? John Stamos. 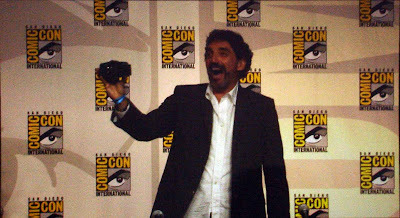 And I say this having laid eyes on George Clooney as well, but I have to tell you that I was more stunned to see Mr. Stamos. No offense, George...you're still number two in my book! So, kind of fun to see something a little inside like this. this hard copy will definitely be a permanent part of my BBT collection, and I'm going to make a point of trying the peanut butter cookies next time I'm lucky enough to have lunch at the Warners Lot. And also - I've seen both John Stamos and Arnold Schwarzenegger over there, and I was way more impressed when I saw Stamos too. 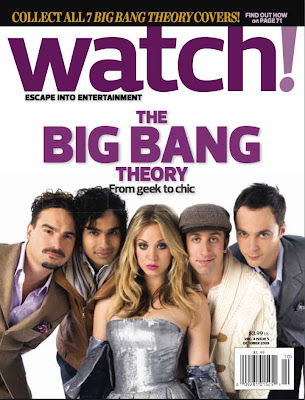 I was very surprised to learn this week that CBS publishes a magazine called Watch! It's been around for about four years, and literally covers all things CBS, past and present. Even better, the cover offers a way to order all seven different covers directly (or specific individual ones, in case, say, you're more specifically a Kaley Cuoco and/or Jim Parsons fan). Too impatient to wait for my Ebay purchase to arrive, I contacted the magazine and they were kind enough to oblige me with a copy of the ad to order from, reproduced below. I suppose I shouldn't feel left out that I hadn't heard of Watch! 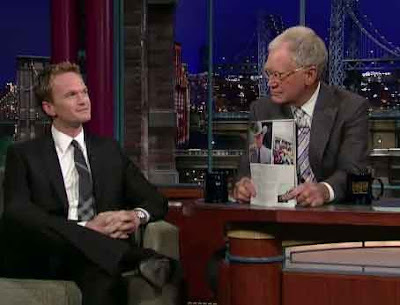 - as you can see in the clip here, David Letterman had never heard of it when Neil Patrick Harris mentioned the publication sent him off on a luxurious trip on the Orient Express for the cover story in the last issue. 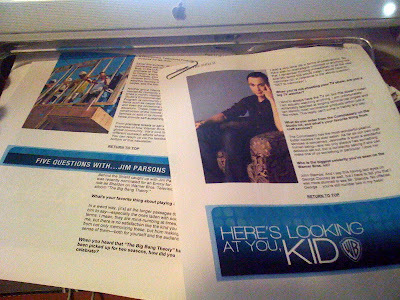 Kids, and Big Bang Theory fans, you can check out the magazine's web site here. Best of all - free three year subscriptions (that's 18 issues) are being offered to the first 50,000 subscribers who sign up by next September, so it looks like you can get your first BBT issue for free! I'm looking forward to seeing this - it looks like a slick publication, and you can't beat the price. Here's the offer for the collector covers - it should expand when you click on it. 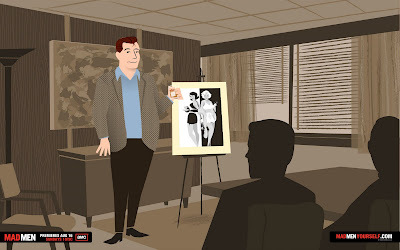 Nobody needs some guy with a blog to tell them how good Mad Men is these days - you either are already watching it, already want to, or have already decided it's just not for you. 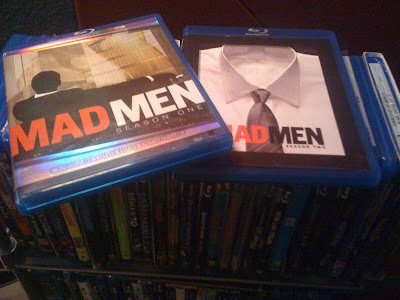 I love the show, watching it on Blu Ray. I will caution that it's not one of those programs you can just leap into the middle of and appreciate - I tried to watch the 6th episode when it was first airing. and friends were first raving about it, and I could not get into it at all. Starting from the beginning, I found it totally engrossing, not just for the compelling characters and story; but for the carefully crafted glimpse into a world that just no longer exists: America, 1960. Mad Men is careful to not just use the early 1960s as an attractive setting, it reminds us how different that world was at almost every turn: after Betty's pregnant neighbor smokes and drinks, without a second thought. A new copy machine - the size of the Buick - is viewed in the office as something that could possibly cause sterility. The Drapers, after a picnic, cheerfully dump their trash on the grass and walk away - they're not bad people, it's just the concept of "litter" was not widely considered at the time. bits of the show remind me of my own childhood, even though I was born in 1966, I had plenty of time to deal with rotary telephones and televisions that required vertical hold. (Kids, ask your grandparents). 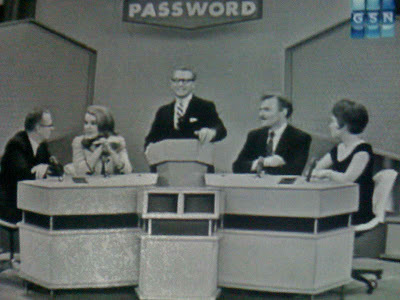 It's curious, also, to note that the Game Show Network offers a little glimpse into the real-life world of the early 60's right now with Password, Alan Ludden's word play game, running an episode each night. 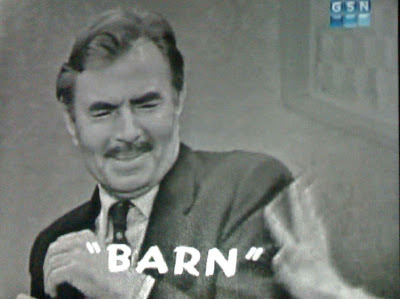 Currently they're showing programs from 1963, right in line with where Mad Men's third season is. What's interesting for me personally is the chance to see celebrities I've never seen out of character before, as themselves, as they were then. Carol Burnett is a delightful player, loves the game, and appeared in an episode playing opposite Garry Moore, her boss - long before she had her own show. 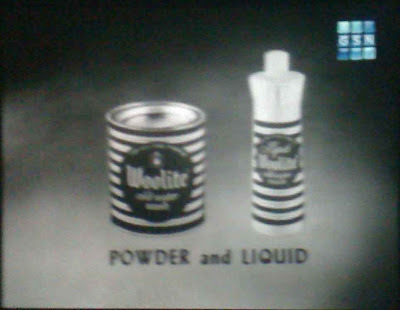 Following are a few screen captures of recent moments"
They often include the original sponsor plugs, something the guys at Sterling Cooper would be glad to see. 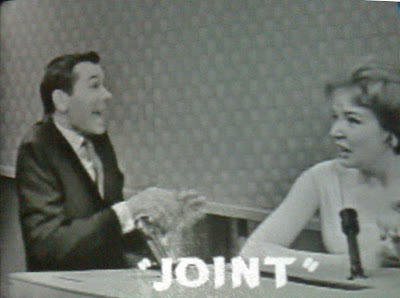 Johnny Carson, delighted when his partner guessed "joint" on a difficult clue. Double entendre words that could relate to casual drug use are often greeted with a chuckle when the celebrities first see the word - then it's never mentioned again. 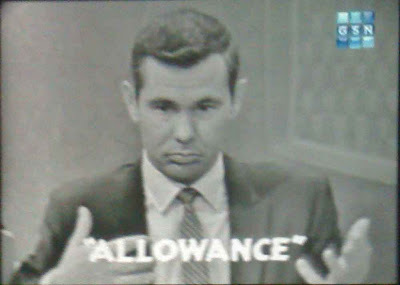 A very young Johnny Carson tries to come up with a one word clue for "allowance." Jane Fonda vs. James Mason, 1963. I had never seen Jane Fonda pre-Vietnam, she is quite the 5th Avenue Hollywood starlet. To her credit, though, she was so engrossed with her partner, a typical guy who worked at a tool and dye company or some such, she chatted with him all through Alan Ludden's entrance. Dahh-ling! 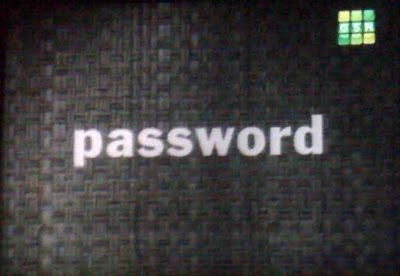 Jane was simply delighted when Ludden asked "How do you play Password?" and her partner answered "badly." 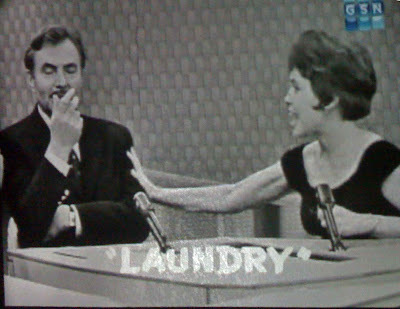 James Mason stiffens noticeably when his rather boisterous partner smacks him in the arm for getting "Laundry" right. The next time, he's ready for it, but he's also laughing. Jane had this odd little move while trying to think of a clue for "blackmail." Jane illegally gives the "sounds like" signal when she comes up with "hangnail" for "blackmail." I'll be honest, I never expected to be much interested in the Game Show Network's programming myself, now I watch it nightly. It literally is a glimpse back into a simpler time. Darren McGavin, when giving the clue "tongue" for the word "lick" to his female partner, said "Please pardon the expression" first. I was right about there.